Palermo’s Capuchin Catacombs are final resting place for some 8,000 bodies, most of them perfectly dressed, some standing, some sitting, others lying down on “shelves” or in open coffins. Catacombe dei Capuccini are part of the 17th century complex of Capuchin Church and Monastery. While the Capuchin Convent still holds some objects of fine religious art, it is mostly known for its catacombs sheltering fully dressed skeletons and mummified bodies of some famous Palermo’s personages. The “chillingly” fascinating story of catacombs started when Capuchin’s cemetery ran out of places forcing monks to excavate underground crypts for “departed” brothers….. The first one was brother Silvestro, whose mummified body was placed in the catacombs in 1599. While initially the catacombs were intended only for Capuchin monks, the fame of the “City of Dead” quickly spread from the Underground World into the streets of Palermo. Soon being buried in catacombs became a symbol of status. The rest is the history – local wealthy people (let’s make it clear – the burial place in catacombs was not for “free”) were securing there final resting place as well as a whole burial process (mummification, embalmment or just the dress). 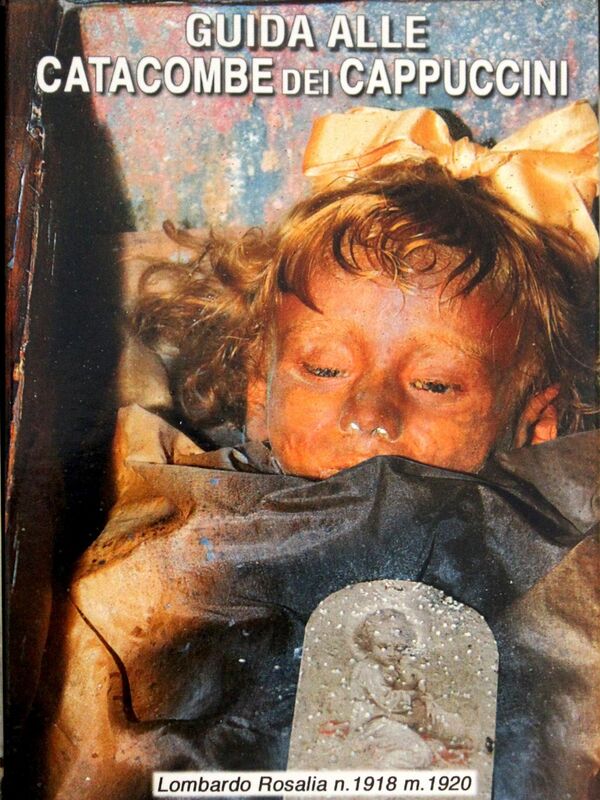 The one of the very last persons to be buried in catacombs was two years old girl Rosalia Lombardo. Her embalmed body is still in so good shape that it seems she left earthly world just yesterday what many consider as a miracle. Today the Capuchin Catacombs are final resting place for some 8,000 bodies. Most of them are perfectly dressed, some standing, some sitting, others lying down on “shelves” or in open coffins. You will even see siblings keeping hands together…. . But you should be aware that it’s not a fairy-tale world of “sleeping beauties”, in fact sometimes it may be a gruesome one. Faces with frozen in time grotesque grimaces, distressingly empty orbits, peeling-off skin from half-bare skulls, teeth in a kind of derisive expressions…. The passageways are arranged separately for women, for man, for professionals, for clergy and monks. Although in our times we tend to believe that “Up There” the order should be quite different (equal rights for “all souls”), we should understand that Capuchins were making their decisions few hundred years ago in a very different “social environment”….. The Underground World of catacombs is the “after-life” place and it should stay this way. Our curiosity and wish to face “unusual” or experience a frightening “haunting house”- like ambiance should not disturb the peace that those buried in catacombs fully deserve. That is why it is forbidden to take pictures in catacombs and even worse - to expose their secrets to the “Outside World”. Keep in mind that the Underground World has its own code and rules.